Shane Hamman finished in seventh place. 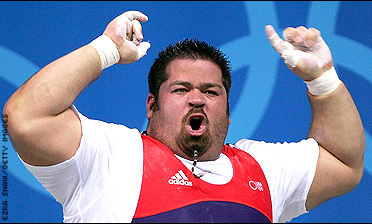 Shane Hamman is still the strongest man in America, but he's not the strongest man in the world. That title belongs to Iranian Hossein Rezazadeh, who lifted 581 pounds in clean and jerk on Wednesday night, setting a world record. Zhang Guozheng's first was expected. Nikolai Peshalov's fourth certainly was not. Shane Hamman can dead lift more weight than any Olympic athlete in America. Imagine being able to hoist the back end of a Ford Focus or a Dodge Neon above one's head, and you get the idea. Cheryl Haworth expects to lift a big weight off her shoulders Saturday, and not just the 600 or so pounds she intends to hoist at the U.S. Olympic weightlifting trials. Bulgarian Olympic weightlifting champion Galabin Boevski plans to appeal an eight-year ban for tampering with his urine sample at last year's world championships. Eleven weightlifters failed drug tests at the World Championships in November in Canada. Vladislav Lukanin, one of Russia's top prospects for a weightlifting gold medal at the Olympics, has been banned for two years for doping.